I have two healthy kiwi plants growing side by side in the ground for about the last 5 years. Not sure what variety they are. When I purchased them the tag said one was a female and the other was a male. They have never produced flowers or fruit. Could I possibly have two males or two females? Would there be any differences in the two? The only way to tell a female kiwi from a male kiwi vine is by the flowers, when they bloom. If you are not getting any flowers, it may not be in enough light. 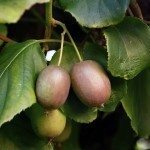 Kiwis need a sunny location, sturdy support, and pruning to produce good crops. 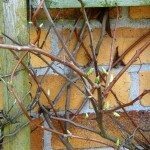 When planted, the vines should be pruned back to 4 or 5 buds. And yes, they need at least one male plant to pollinate female varieties. Good female varieties to choose from include Abbott, Bruno, Hayward and Monty. Male varieties include Tomuri, Atlas and Matua. Examining the flowers of a kiwi are the only way to determine for sure if you have a male or female plant if unknown or incorrectly labeled. Since yours is not blooming, you may want to consider getting a male variety and plant it nearby.